Boris Lvovich Rosing (Russian: Борис Львович Розинг; 23 April 1869 (old style, 5 May 1869, new style). – 20 April 1933) was a Russian scientist and inventor in the field of television. Boris Rosing was born in Saint Petersburg into the family of a government official. His father, Lev Nikolaevich Rozing, served on the commission for military service (conscription) under Czar Alexander II. Rozing was a descendant of the noble Rozing family, founded by Dutch immigrant Peter Rozing. Lev developed an interest mathematics and technology, including recent inventions, which he communicated to his son. From 1879 to 1887, Boris studied at St. Petersburg's Vvdensky gymnasium, from which he graduated with a gold medal. There, he distinguished himself in his studies of the exact sciences, literature and music. He then studied physics and mathematics at St. Petersburg University, which was a major research center. The distinguished faculty included the chemist Dmitri Mendeleev and the mathematicians Pafnuty Chebyshev and Andrey Markov. After graduating with honors in 1891, he remained at the university to pursue graduate studies in physics. The subject of his dissertation was magnetic hysteresis. He discovered hysteresis in the lengths of iron wires in the presence of cyclic magnetic fields, a phenomenon that was discovered independently by the Japanese investigator Hantaro Nagaoka. He subsequently became a physics instructor at the St. Petersburg Institute of Technology. Starting in 1894, he also taught physics at the Konstantinovsky Artillery School, and from 1906, he lectured on electrical and magnetic measurements as part of women's polytechnic courses. During 1894–1900, he continued his studies of magnetism but also worked on several practical electrical problems. He taught at the St. Petersburg Institute of Technology until 1918. He then conducted research at the Leningrad Experimental Electrotechnical Laboratory from 1924 to 1928 and at the Central Laboratory for Wire Communications from 1928 to 1931. Rosing's interest in television — or the "electric telescope", as he called it — began in 1897. Others had tried to develop a mechanical version of television. Rosing recognized the shortcomings of mechanical television; he thought that the image should be displayed electrically on a cathode ray tube (CRT). By 1902, Rosing began actual experimentation to test his ideas: he constructed a simple apparatus for electrically deflecting the beam of a CRT, which allowed him to draw figures on the tube's screen. At that time, mechanical devices scanned an image onto a selenium photoresistor, the resistance of which varied in response to the light striking it. However, selenium photoresistors responded to changes in light levels too slowly to accurately reproduce moving images. Therefore, Rosing used a photocell, a piece of alkaline metal in a vacuum tube which emitted electrons in response to light. Once Rosing had developed a rudimentary working television that incorporated his two innovations — a photocell detector and a CRT display — he filed a patent application in Russia on 25 July 1907 and — on the improved version of his system, which included magnetic deflection coils around the CRT — on 2 March 1911. He followed up with a demonstration of which a report was published in the Scientific American with diagrams and full description of the invention's operation. During 1912–1914, he did theoretical and experimental work on magnetic lenses. In 1918, he co-founded the North Caucasian Polytechnic Institute, now the Kuban State Technological University. In the early 1920s he resided in Krasnodar (formerly: Ekaterinodar), near the Black Sea. There, in 1920, he co-founded the Ekaterinodar Physical-Mathematical Society and became its chairman, and in 1923, he wrote his booklet The Electric Telescope: Vision at a distance. Rosing's invention expanded on the designs of Paul Nipkow and his mechanical system of rotating lenses and mirrors. Accordingly, Rosing's system employed a mechanical camera device, but used very early cathode ray tube (developed in Germany by Karl Ferdinand Braun) as a receiver. Rosing's Braun Tubes consisted of two parallel metal plates that were used to electrically shift the electron beam itself before it was scanned and reached the screen. These two plates were connected electrically to the photoelectric cell in the camera. Depending on the output of the photoelectric cells, the beam would be deflected up or down before entering the concentrating plate. Since this movement increased or decreased the number of electrons passing between the plates, it had the effect of varying the brightness of the electron beam. The system was primitive, but it was definitely one of the first experimental demonstrations where the cathode ray tube was employed for the purposes of television. V. K. Zworykin, who pioneered television in the United States and Germany, was a pupil of Rosing and assisted him in some of his laboratory work. In 1925, B. Rosing advised and helped young inventor Boris Grabovsky apply for a patent (issued under No 5592) of a fully electronic TV set, called Telefot. Rosing continued his television research until 1931 when he was exiled as a counter-revolutionary to Kotlas without right to work, but in 1932 was moved to Archangelsk, where took up physics at the Forestry Technology Institute. Rosing died in exile in 1933 of cerebral hemorrhage. He was buried in the Arkhangelsk Vologda (formerly: Kuznechevskaya) cemetery. ^ "The story of BBC Television – How it all began". BBC World Service. Paul Marshall (2011) "Inventing Television: Transnational networks of co-operation and rivalry, 1870–1936," Ph.D. thesis, University of Manchester (England), pp. 194–197. ^ B. Rosing (1895) "On the change of length in soft iron wire placed in a uniform magnetic field," Philosophical Magazine, 5th series, 39 : 226–228. ^ Albert Abramson (1995). Zworykin, Pioneer of Television. University of Illinois Press. pp. 213–. ISBN 978-0-252-02104-6. British patent no. 27,570 / 1907 (filed: 13 December 1907 ; issued: 25 June 1908), "New or improved method of electrically transmitting to a distance real optical images and apparatus therefor"
Boris Rosing, "Art of electric telescopy," U.S. Patent no. 1,161,734 (filed: 5 April 1911 ; issued: 23 November 1915). Boris Rosing, "Electrical telescopy," U.S. Patent no. 1,135,624 (filed: 5 April 1911 ; issued: 13 April 1915). British patent no. 5,486 / 1911 (filed: 4 March 1911). Robert Grimshaw (1 April 1911) "The "Telegraphic Eye" ," Scientific American, 104 : 335–336. Jacques Boyer (17 June 1911) "Prof. Rozing's 'Electric Eye' — a new apparatus for television," Scientific American Supplement, 71 (1850) : 384. (Ernest Ruhmer) (23 December 1911) "Important step in the problem of television," Scientific American, 105 : 574. ^ "Boris Lvovich Rosing". Retrieved 26 October 2012. ^ B.L. Rozing (1923). Электрическая телескопия: Видение на расстоянии [The Electric Telescope: Vision at a distance]. Petrograd, Soviet Union: Academia. ^ "VLADIMIR K. ZWORYKIN (1889–1982)". M.I.T., The Lemelson Foundation. Retrieved 26 October 2012. This is a list of television-related events that occurred prior to 1925. Boris Pavlovich Grabovsky (Russian: Бори́с Па́влович Грабо́вский 26 May 1901 – 13 January 1966) was a Soviet engineer who invented a first fully electronic TV set (video transmitting tube and video receiver) that was demonstrated in 1928. 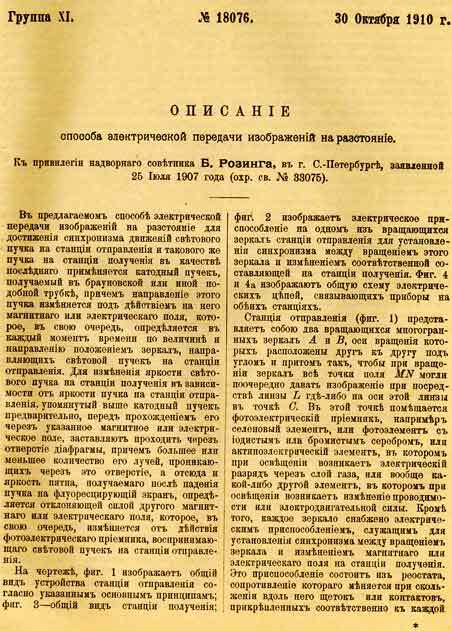 In 1925, one of the pioneers of television Boris Rosing advised and helped him apply for a patent (issued under No 5592) of a fully electronic TV set called Telefot.In his method patented in 1925, Grabovsky proposed a new principle of the TV imaging based on the vertical and horizontal electron beam sweeping under high voltage that is widely used in the modern cathode-ray tubes. A historian and ethnographer Boris Golender (Борис Голендер in Russian) in his video lecture described in details where and how the inventor Boris Grabovsky demonstrated a first fully electronic TV set to committee and public in summer 1928. Although this date of demonstration of the fully electronic TV set is the earliest known so far, most of the modern historians claim that either Vladimir Zworykin or Philo Farnsworth were supposedly first. Contribution made by Boris Grabovsky to the development of early television was acknowledged by the Government of the USSR and in 1964 he was awarded a prestigious degree 'Honorable Inventor of the UzSSR'. Boris Grabovsky was born in 1901 in Tobolsk, Siberia, where his father, a prominent Ukrainian poet Pavlo Hrabovsky was living in exile as a member of the Russian revolutionary movement Narodnaya Volya. After the death of his father the next year, the family moved to Odessa then to Kharkov. In 1917, they had to move to Central Asia, to Kyrgyz village Tokmak. He died in January 1966 in Frunze. Boris Grabovsky started his education in Tashkent special school. Then he entered preparational faculty of Central Asian University in Tashkent where he worked with Prof. G. Popov. In the university he read articles by Boris Rosing in the field of electronic telescopy. Being excited by the idea of the transmission of images over a distance, he invented the cathode commutator, which was the first prototype of his transmitting tube. Lazare Weiller (20 July 1858 – 12 August 1928) was a French engineer, industrialist and politician. He was born in Alsace and received a technical education in England and in his cousin's copper factory in Angoulême. He was very interested in the physical sciences, particularly the use of electricity to transmit sound and images. He proposed a system for scanning, transmitting and displaying images that was the basis for experiments by various television pioneers. He sponsored early aviation experiments by the Wright brothers. He founded several companies including a telephone wire manufacturer, a taximeter manufacturer, the first Parisian cab company to use automobiles, an aircraft company and a wireless telegraphy company. He was a deputy during World War I (1914–18) and then a senator until his death. This list of Russian electrical engineers includes the electrical engineers, inventors and physicist from the Russian Empire, the Soviet Union and the Russian Federation. See also the Category:Russian electrical engineers. This list also includes those who were born in Russia or its predecessor states but later emigrated, and those who were born elsewhere but immigrated to the country or worked there for a considerable time, (producing inventions on Russian soil). For Russian inventions in chronological order, see the Timeline of Russian inventions and technology records. This is a list of notable inventors. It is made up of 24 specialized faculties and institutes,the Academic Gymnasium, the Medical College, the College of Physical culture and Sports, Economics and Technology. The university has two primary campuses: one on Vasilievsky Island and the other in Peterhof. During the Soviet period, it was known as Leningrad State University (Russian: Ленинградский государственный университет). It was named after Andrei Zhdanov in 1948. Sillamäe (known also in Germanized version as Sillamäggi or Sillamägi (Estonian for "Bridge Hill"), is a town in Ida-Viru County in the northern part of Estonia, on the southern coast of the Gulf of Finland. It has a population of 13,666 (as of 1 January 2017) and covers an area of 10.54 km². Sillamäe is located at the mouth of Sõtke River. Scientific and medical discoveries, like the periodic law, vitamins and stem cellsThis timeline examines scientific and medical discoveries, products and technologies introduced by various peoples of Russia and its predecessor states, regardless of ethnicity, and also lists inventions by naturalized immigrant citizens. Certain innovations achieved by a national operation may also may be included in this timeline, in cases where the Russian side played a major role in such projects.